This paean to vanilla was partly inspired by a visit to the Heilala plantation. an organic, fair-trade, family business in the Kingdom of Tonga. 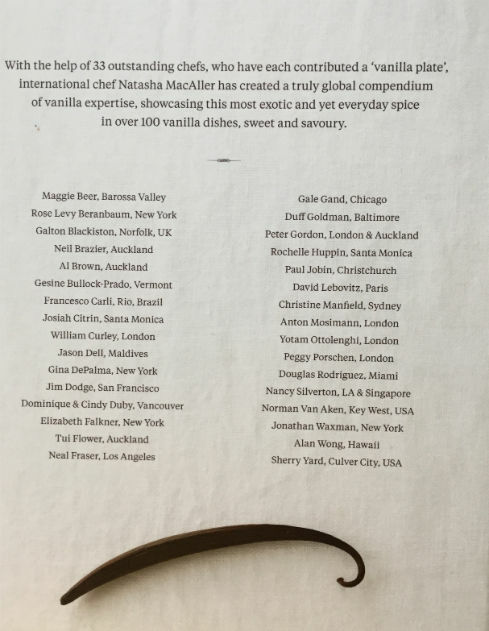 There at the First International Vanilla Food and Wine Event, MacAller and New Zealand chef Peter Gordon (who wrote the foreword for the book and contributed a recipe), created, cooked and served a range of vanilla dishes. Part of the proceeds of her book will be donated to the Heilala Vanilla Foundation. 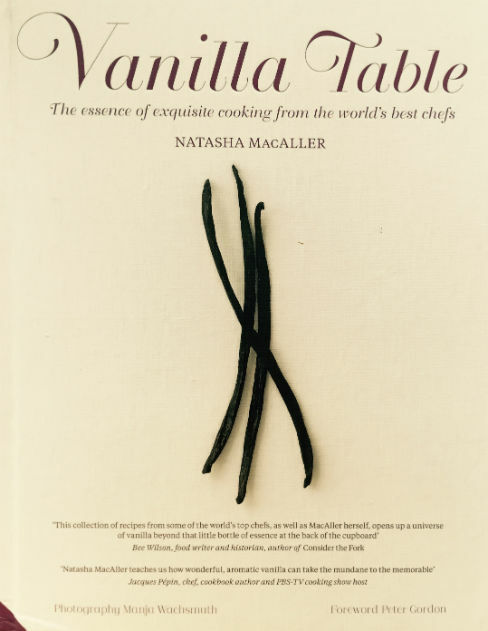 After MacAller describes the origin of her lifelong passion for vanilla and the fascinating story of her transition from professional ballerina to professional chef, she introduces her readers to the basics about the sources of vanilla and vanilla products, extracts, powders and pastes in Vanilla 101. In the chapter titled Vanilla Pantry are many simple recipes for creating one's own flavourings such as vanilla sugar, or vanilla oil. Vanilla Table is an elegant book, from cover design and photographs to the layout of the recipe pages. Ingredients are shown in clearly laid out tables that give required volumes as well as metric and imperial weights. The instructions are simple and clear. The photographs by Manja Wachsmuth are exquisite. While the majority of the recipes were conceived and created by MacAller, aka the Dancing Chef, she has also included recipes from 32 international chefs from New Zealand, Australia, Brazil and England as well as North America. Chapters are as shown in the photo of the index. There is a nice mix of dishes, about half of the recipes being for starters, main or brunch courses and sharing plates, and half for sweeter dishes, dessert, cookies and cakes. I loved paging through the book. I could almost taste the dishes just reading down the list of ingredients but watch for the story of The SASSY Club cooks from the Vanilla Table . This book belongs in the kitchen of any foodie, especially those who love the aroma and flavour of the vanilla bean. Read about my conversation with Natasha here.